Dead and Buried is getting a major update today that adds two new characters, a new map, a new weapon, and a 1-player mode, plus several improvements. 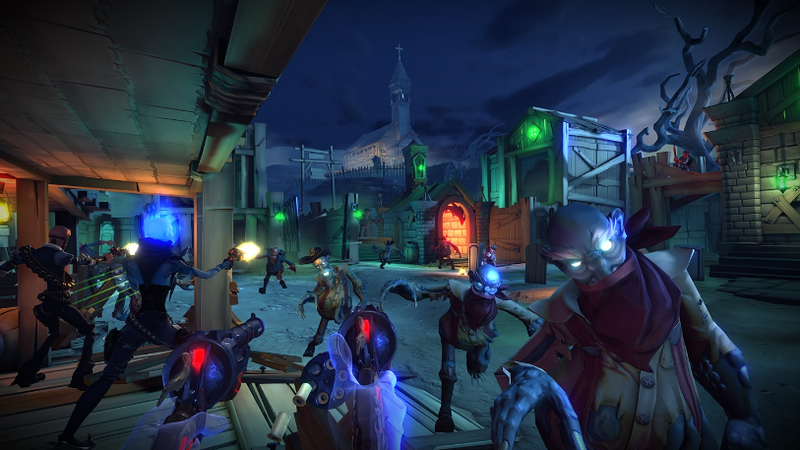 Dead and Buried (Oculus Rift; HTC Vive via Revive) is a Western / sci-fi / fantasy shooter with both cooperative and competitive online multiplayer modes. It is one of my favorite games for the Rift, and one of the most fun VR games I’ve played on any VR system. 1. Two new characters — a gunsmith and a spirit warrior — with 10 unlockables each. 2. Shootout mode will feature a new rifle. 3. Shootout mode will feature a new single-shot sniper map. 4. Horde mode: new boss. 5. Horde mode: new resurrect gun (to resurrect your teammates). 6. Horde mode: 1-player mode. 7. Matchmaking: a player who is inactive after a set amount of time will be dropped from the lobby; games will auto-start after 60 seconds. I’m looking forward to trying these out!